This sandwich is almost too simple. But also easy to screw up. Ingredients are the key to this southern sandwich’s culinary mysticism. White bread. Soft, white bread. The kind of white bread everyone is always poo-pooing. Like Wonder Bread. Or if you want to go faux High-Brow, get Pepperidge Farm white bread. Mayonnaise. Hellmann’s. Or Duke’s, the mayo many southerners swear by, although it’s hard to find anywhere north of the Mason-Dixon. A Big, Fat, Juicy Homegrown Tomato. Must be at the peak of ripeness. If you don’t grow them yourself or have access to a neighbor’s backyard bounty, get it from a farmers’ market. Again, it MUST be ripe. DO NOT BUY IN A SUPERMARKET! And, did I mention it must be perfectly ripe? I prefer a big beefsteak variety; an heirloom like Brandywine is perfection. The one in the picture is a Black Krim, also delicious. Cut a thick slab, ¾ of an inch, at least. If you don’t have a ginormous tomato, several thick slices of smaller tomatoes will do. Slather mayo on both slices of bread. Don’t be shy. Slap the slab of tomato on one piece and liberally apply sea salt and fresh ground pepper. Apply the second slice of white bread. See the mysteries of the universe unravel before you. Wipe the juice from your chin. I recommend you eat this while standing over the sink, gazing off into the distance. Ignore all earthly distractions until you’re finished. Feel the ecstasy down to your toes. And try these alternatives: Substitute toasted sourdough. Add a little fresh basil. And, of course, adding bacon and lettuce is never wrong. Do you have a favorite summer sandwich? Or a favorite sandwich featuring tomatoes? This entry was posted in Gardening, Recipes, Uncategorized and tagged black krim, farming, flower garden, heirloom, heirloom tomato, Kentucky, Ohio, Ohio River Valley, organic gardening, recipe, south, southern, tomato, tomato sandwich, vegetable, vegetable garden. Bookmark the permalink. BLTs are a must in the summer for us, too. And toasted sourdough with strawberry jam? Delicious! You are clearly a man of courage, character and conviction to be extolling the benefits of white Wonder Bread on the blogosphere. Well done! That sandwich sounds delicious! And yes should definitely be eaten outside or over the sink. We go for the Hoosier Pizza around here. An openface sandwich with bread on the bottom, big fat thick slice of tomato above that, cheddar cheese above that – all toasted until the cheese is melted and the tomato is hot. The bread inevitably becomes soggy but that is part of what makes it special. A tasty summer treat. Thanks, Jim! And thanks for the tip…I’ll be trying that Hoosier pizza this weekend. Sounds delicious! You’ve nailed summer in a sandwich. Thank you. May I suggest adding corn on the cob (also necessarily a farmers’ market purchase) to the menu for a swoon-worthy summer supper? Cheers! Indeed! Can’t go wrong with those! My dark gardening secret is that, despite growing heirloom tomatoes and being raised in Atlanta, I still have yet to try this. I feel guilty even as I type this to admit that. I grew up not liking tomatoes, so I was never shown the light. And I want to conquer my tomato sandwich eating fear. I think you have motivated me with your tantalizing sales pitch. Though the “pizza” below also sounds like a must try also. Thanks for sharing your dark secret 😉 Let us know if you tried it and what you thought! I think I’ll try the Hoosier pizza this weekend. I grew up eating Merita bread and my family grew lots of tomatoes, so your recipe sounds spot on. Happy eating. Thanks! And cheers to summer and all the treats it brings! I had to laugh because we saw a commercial for Duke’s Mayo on television last week and both myself and the wife looked at each other with the “what is that! ?” look. Here in Pennsylvania it’s Hellmann’s country and I’ve never heard of Duke’s before! The tomato looks worthy of the sandwich, love the color. Thanks! It was as delicious as it was pretty! We like this on potato bread at our house–nice and soft and bland. I’ve been making roasted vegetable sandwiches for my family this year–zucchini, yellow squash, eggplants, peppers . . . brush them with a thin coat of olive oil, sprinkle with salt and oregano, and grill until there are brown grill marks. Good on a nice quality batard or ciabatta. We turned them into paninis last night. Yum! Now, I haven’t had lunch yet, and I do have a couple nice ripe tomatoes out there . . .
Mmmm, we’ll have to try the roasted veggie sandwiches! Thanks! And there’ll be no judgement on non-sophisticated food here, as long as its delicious! 😉 Cheers! Oh my. Drool. Yum. I shouldn’t have read this, now I’m hungry! Sorry about that 😉 Hopefully you have access to a big juicy tomato! Cheers! We don’t usually slather the Hellmann’s in this household, mixing it instead with other spread or salad dressing ingredients (e.g. yogurt or grated cheese). Yesterday, though, I toasted and buttered (yep, butter!) two slices of bread, slathered on the Hellmann’s, topped each toast with tomato slices and salami, and topped the whole thing with gobs of grainy dijon. And a mere two hours later, you came by and “liked” one of my posts. Coincidence? “See the mysteries of the universe unravel before you.” Exactly! Oh, you’re breaking my heart. I moved from Minnesota, where (in between snow storms) we grew gorgeous tomatoes, to the U.K., where in eight years I haven’t been able to grow a tomato worth bothering about. It just doesn’t get hot enough for long enough. Or that’s my theory anyway. Tomatoes do love the heat. I’m not sure I could call any place home where I couldn’t grow tomatoes 😉 Perhaps you could find a variety adapted to a more northerly clime. Cheers and Bon Chance! 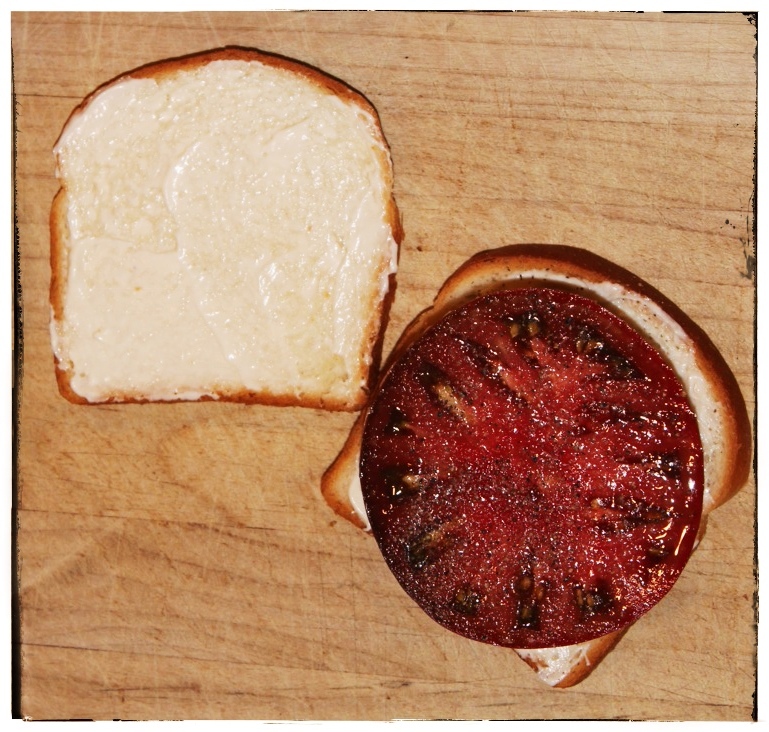 This is our family’s classic tomato sandwich as well, right down to the Wonderbread!! Wondering if this could be an American classic? Not to mention the effects of all that Wonderbread…lol!! Ha! Even though I’ve been gorging off of IDENTICAL homegrown tomato sandwiches for 3 days in a row now, reading your post still literally made my mouth water! Too funny. I concur 100% with everything you said and how you make it. Sooo simple and oh so good! Now that is a proper sandwich!